For aromatics producers, becoming more energy efficient is important in order to reduce emissions and to become more profitable. 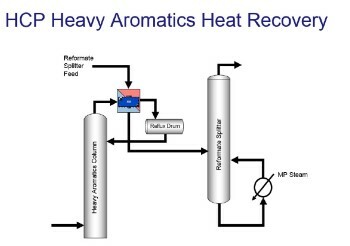 Hence, the design of aromatics plants includes a level of heat recovery, however, these are primarily based on using traditional shell and tube technology. Innovators in the aromatics industry, such as Hyundai-Cosmo Petrochemical, are finding ways to update these heat integration philosophies by applying plate technology to recover energy in condenser applications. A focus on adding capacity of aromatics production in recent years has dramatically impacted the profitability of producers globally. Manufacturing these petrochemicals, which include benzene, toluene, and xylene (BTX), provides key building blocks for everyday consumer goods such as polyester, polystyrene and nylon. It requires a tremendous amount of energy to drive the distillation columns used to separate these products. New approaches in heat integration now make it possible to upgrade outdated facilities that used heat integration philosophies optimised around traditional heat exchanger technology. The adoption of more energy efficient technologies can help aromatics industry plant managers cut energy costs while maintaining product quality. One area that is found to be under utilised in making the plants more efficient is in the condensers of the distillation columns. Identifying a heat sink where condenser energy can be utilised often presents a challenge for existing plants. 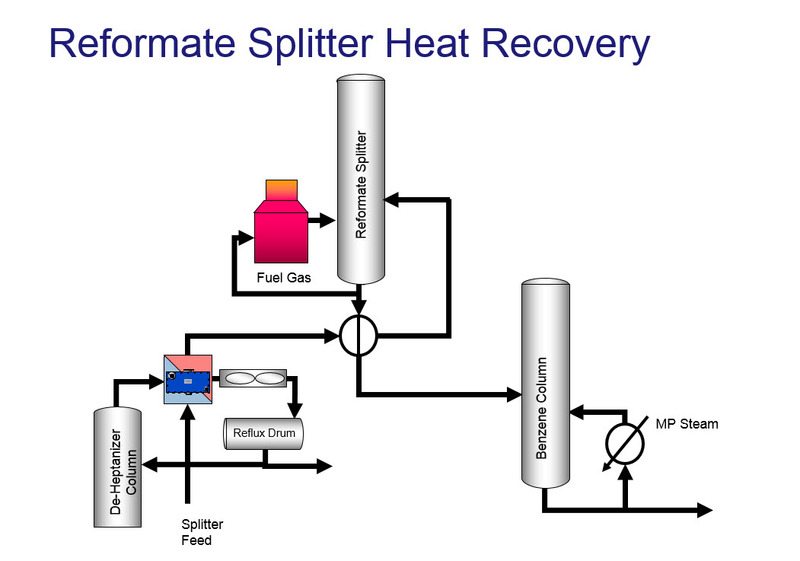 If a plant has energy needs associated with utilities, such as preheating boiler feedwater or creating low pressure steam, then it is relatively easy to use the heat recovered to match the duty for those streams. It is much more complex to evaluate opportunities within a process when some degree of heat integration already exists in the process design. Adding energy to one area of the plant naturally has an effect on the other heat exchangers in the process. Determining the best heat sinks in any process will require the support of an experienced solution provider or external process consultant. They will need to review the current process design and determine how it can be reconfigured to meet energy savings goals. 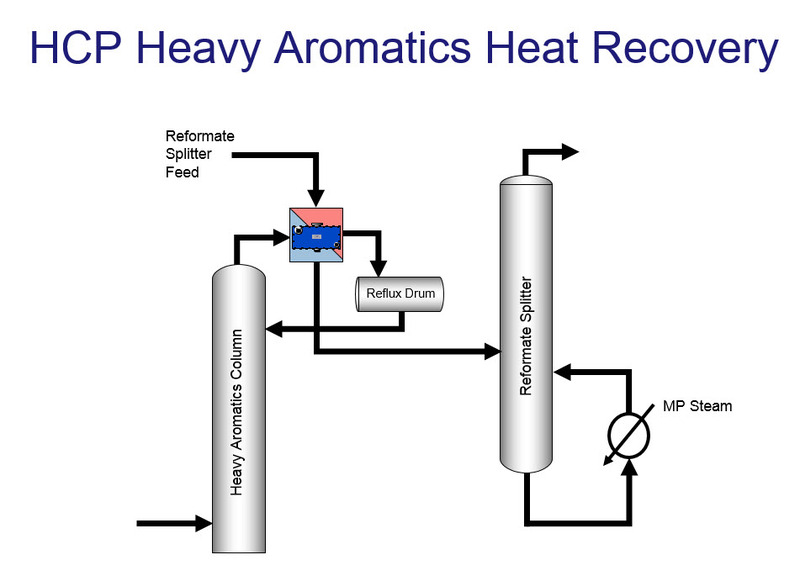 Most of the distillation columns in aromatics processes operate at low pressures, leaving a small amount of pressure drop available to use for the condensers. The challenge in heat exchanger design is that, typically, as the level of heat recovery increases in a condenser, the amount of pressure drop also increases. As the pressure drop increases in the overheard circuit, a higher operating pressure is required in the column to overcome it. This higher operating pressure requires the reboiler to add more energy to the system, making the net energy change a net-sum zero. When evaluating any project, it is important to consider the total investment costs – not only the capital expenditure for the equipment itself, but installation, operating and maintenance costs, which often exceed the initial investment. Due to the nature of distillation columns, condensers tend to be located at the top of the structure. 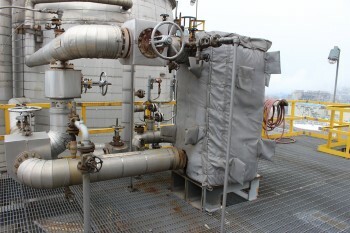 Modification of the structure to install heat exchangers can be costly, especially in regions where seismic conditions require structures to be more robust. losses. 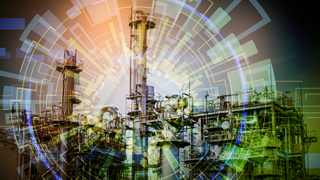 Aromatics plant owners and operators must select reliable solutions that can be maintained over the lifecycle of the equipment. licensors, are now using advanced plate technology in all regions to recover and reuse heat from condensing applications. Alfa Laval Compabloc welded plate heat exchanger. 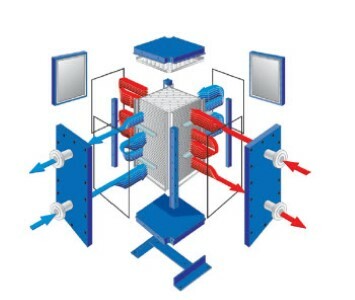 Compact size: due to the higher heat transfer coefficients and plate pack design, the size and weight of the heat exchanger will be over 50% less than traditional technology.When condensers are located up in structures, this will be a significant saving in terms of cost, as in many cases it will not require modification to existing structures. Figure 3 shows a typical condenser installation on a platform in the plant. 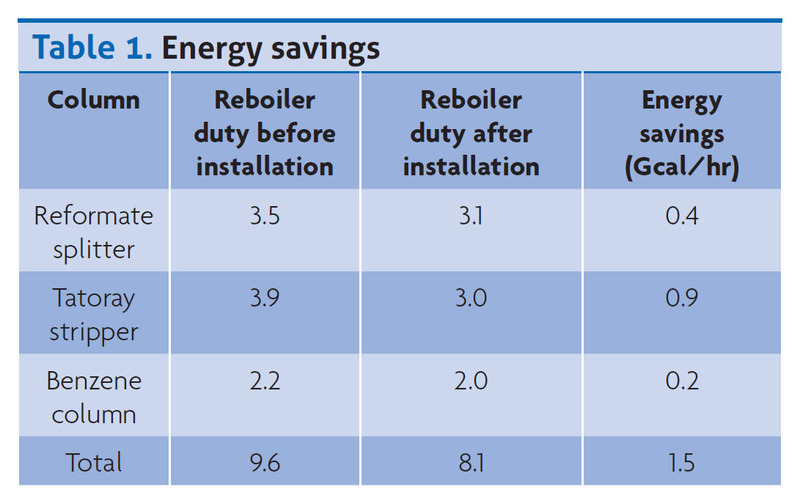 Increased heat recovery: in many projects, the level of heat that is needed to be recovered is high, but the thermal requirements for the heat exchanger would not allow it to be feasible. With the higher heat transfer coefficients that plate technology offers, more energy can be recovered with a reasonable amount of heat transfer area that offers returns that will allow projects to move forward. Debottlenecking: when producers are increasing the production of their facilities, there are pieces of equipment that become the bottleneck. This equipment needs to increase in size to handle the increased capacity, but in existing facilities the amount of plot space for new equipment is often limited. 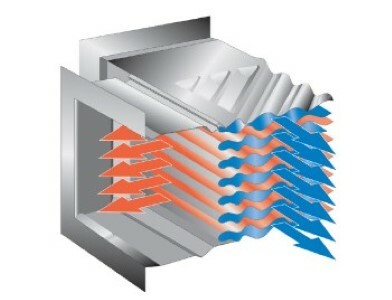 Plate technology allows the producer to increase the capacity of the facility in the same, or smaller, plot space of the existing heat exchanger. Compabloc installation on a platform. The design of plate technology also allows for higher levels of energy to be recovered in a single unit. For condenser duties, this can be very interesting for two different reasons. The first would be in applications that require total condensing and significant subcooling (15˚C). With traditional technology, it may take two steps to condense the vapour, and then subcool the vapour. With an understanding of how to design the plate technology properly, this can be done in a single unit. The second duty is where the application calls for a higher cold outlet temperature than the hot outlet temperature. 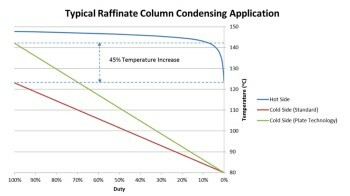 An example of where this can be taken advantage of is in the condenser of a raffinate column used in paraxylene recovery. As the heat release curve has a steep drop near the end of the condensing curve, it is difficult to achieve a high cold outlet temperature. Figure 4 displays a typical profile. By understanding the application and designing the plate technology properly, plant operators can have higher grade heat to use in their plant. 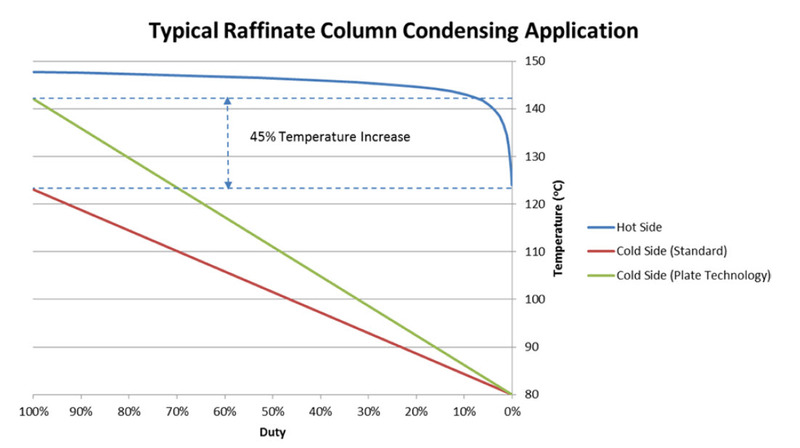 Heat release curve for raffinate column application. Lower vapour inlet temperature for the same duty: in many cases when one is looking at this application, the column will be re-designed with a higher vapour temperature. This will require a higher column pressure and increased reboiler load. Utilising plate technology many times, the vapour temperature can be maintained while achieving the same duty. Higher boiling pressure/temperature: in applications where the customer is converting waste energy into steam, having a closer temperature approach will allow the customer to generate it at a higher pressure that could be more useful to the plant. Hyundai Cosmo Petrochemical (HCP) considered cutting edge technology to help achieve its energy reduction goals. Energy costs in South Korea are among the highest in the world, with steam costing upwards of €80/t. With the help of a process consultant, HCP identified three applications within the company’s BTX complex that held potential to deliver significant energy reductions. Two of these involved condenser applications. The first condenser application handled the deheptaniser overheads and used the recovered energy to preheat the feed to a stripper column. 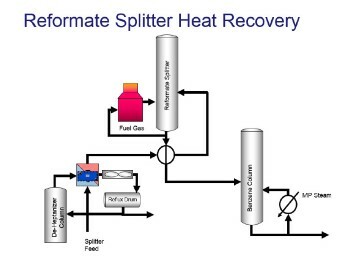 The second application involved the heavy aromatics column and used the recovered energy to preheat the feed to the reformate splitter (Figure 5). There were also issues with the condensers; to achieve full condensation during the summer months, water had to be sprayed into the fans to increase the duty utilising evaporative cooling. The main challenge in both cases was the limited space available to install heat recovery condensers. Due to their high efficiency and compact size, Alfa Laval Compabloc heat exchangers were selected because they fit onto the current overhead structure without requiring any modifications. After the units were started up, the customer saw an immediate impact on the energy savings in the reboilers for the columns. 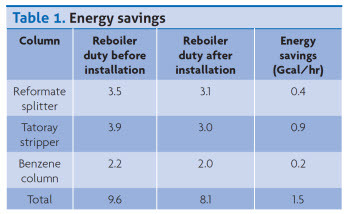 Table 1 shows the amount of energy used before and after the condensers were put into operation. In today’s highly competitive environment, global aromatics producers must find innovative ways to reduce OPEX. Heat recovery has proven to be a viable way to reduce fuel costs and optimise the condensing processes in the aromatics industry. 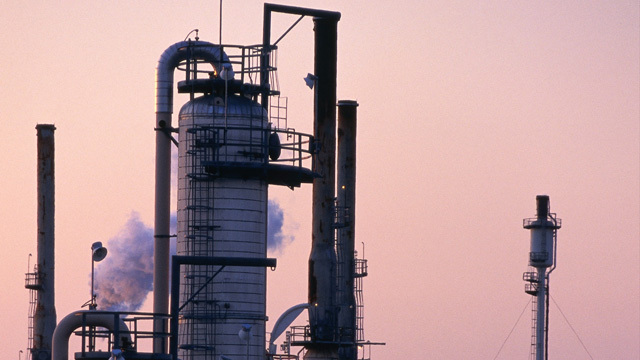 To achieve a more sustainable business, producers must find ways to reduce furnace emissions. Today, aromatics processes must be evaluated to understand how to break away from conventional thinking for heat recovery and how high efficiency heat exchangers can deliver measurable energy savings. Process flow diagrams of applications.